The most striking tractors on display at this week’s Danish Agromek show are a couple of modified 1980s-made Murray ride-on lawn and garden versions that have been converted for tractor pulling. A popular sport with Danish youngsters, the two tractors on the Köckerling stand, which belong to Danish representative Mikael Nielsen, are driven at tractor pulling competitions by his two sons of nine and 11! 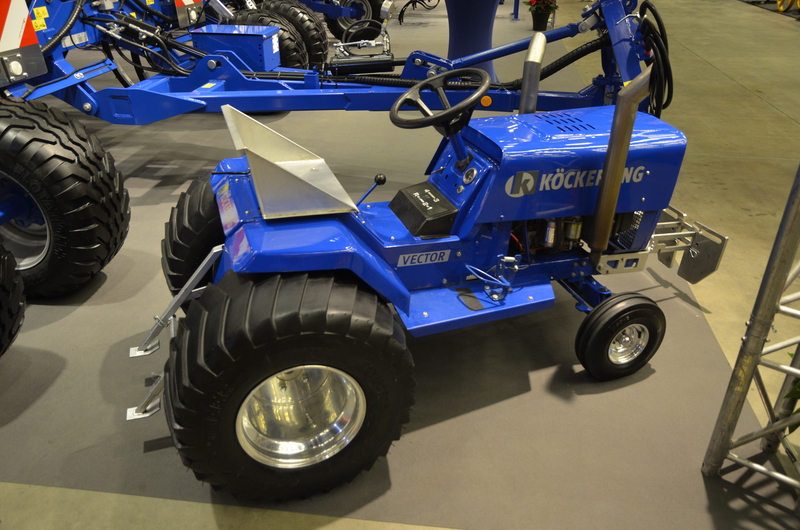 Finished in Köckerling colours, and named after one of the company’s cultivators, the Vector tractor on the stand is for tractors with a maximum weight of 250kg, while the Ultima model is for the 350kg class. The rules stipulate a maximum standard engine power of 29hp, but they are allowed to tweak the blocks. Power to both Mr Nielsen’s tractors comes from a Briggs & Stratton engine, but the blocks have been tweaked and now deliver more than the standard 23hp. Also, the engines normally run at a maximum speed of 3,600rpm, but these two tractors now run at a much faster 5,200rpm. Other modifications include a couple of smart exhaust stacks, plus aluminium engine hoods and fenders to keep the base weight down. As many as 26 x 1.25kg blocks can be added to the front and rear of the tractors as required. Tilt plates must be added at the rear to prevent then from tipping over, and the two tractors are both fitted with emergency stop buttons. This is the third year that Mr Nielsen’s two sons have competed in tractor pulling competitions. They did 23 this year. The weights they are required to pull vary, but the maximum weight is 600kg, and the maximum speed of the two tractors is 30km/hr. He has another tractor for his third four-year-old son, who is not allowed to compete in ride-on lawn tractor pulling until the age of six. For now, he must be patient because he is only allowed to practice at home!